Remember the headlines that we have 10-15 years to save the planet? Six years ago Tony Blair warned that the world will reach "catastrophic tipping points" on climate change "within 15 years, unless serious action is taken to tackle global warming." The Guardian from 2006 quoted him saying "We have a window of only 10-15 years to take the steps we need to avoid crossing catastrophic tipping points." This rhetoric was deployed in the run up to the climate summit in Copenhagen in 2009. After its failure it seemed to have been forgotten, almost an embarrassment. Mainstream politicians, keen to use the rhetoric before 2009, seemed to have ditched it afterwards. But the Guardian today picks up on the story and reminds us that we have reached "halfway point": we have only 50 months left from the original 100 (let's leave aside the arithmetic and starting points for such calculations). Various commentators make their point about possibilities for action (community engagement, entrepreneurship, personal behaviour change, active eco-state, etc). Major political players are absent. Is this a sign that this variant of catastrophism has moved into the margins of discursive space? "Extraordinarily, however, in spite of the stakes, the issue has receded from the political frontline like a wave shrinking down a beach. This could, though, merely be a prelude to it returning with a vengeance. Politicians may have turned their backs, others have not." Certainly, it may be that the warming process behaves a bit like rising water with waves on top of it - it creeps up the beach with receding episodes in between. However, in such an environment it is difficult to determine, let alone measure that the level is actually rising (because of the wavy noise). A significant dimension of the 6-year old sin is, however, that at that time nobody was hinting to the presence of waves (and the associated difficulty to see the rise). Admittedly, nobody said explicitly there are "no waves", but many readers will have presumed there would be a smooth increase (just as Vahrenholt believed that wind speeds should go up monotonously). Now, this gentleman is now claiming: it is all waves ... and the attention generated by the headlines from 2006 has been replaced by broad lethargy. This type of stupid alarmism has no sustainable effect; on the contrary, it is not only not paying off (for the intended "good cause"), it is even counterproductive. to me the quote you have picked out above is little more than wishful thinking. Politicians across the world have realized how difficult it is to make decisive progress in the short to medium term. If they were to embark on a course of radical CO2 abatement, flying the flag of now-or-never-catastrophism, their ship would run ashore the rocks of economic realities and popular resistance. This makes it unlikely that politicians will return to this rhetoric. "Yesterday, at short notice @BBCr4today dropped 2 scientists set to discuss we have #50months left to act on climate, for Korean pop music"
Please note that none other than James Hansen said when Obama was elected that the United States had until the end of his first term to 'do something' or it would be too late. Nothing was done, and no one is taking about Hansen's dire prediction. These people are identical to the end-of-the-world people who predict a date, see it pass, and then 'revise' their predictions to a few more years into the future. "Politicians may have turned their backs, others have not." And these others take the more or less "invented" date of no return as an opportunity to express their opinions in the Guardian - quite an interesting read! the US has reportedly reduced its CO2 emissions due to the shale gas revolution. So 'something' was done, no? my tacit assumption was that the issue has much less political traction if you loose the high profile politicians. It then becomes a protest issue, with the usual suspects involved. The climate alarm ("the most important problem facing mankind") has been so strong because political elites had bought into it. If they pull out, the issue will become one among many. Protest groups would be ill-advised to continue with the debunked "time is running out" rhetoric. you never know - not even if time is running out or not. Protest groups are not scientists, they can easily speak in symbols and metaphors. It is a difference if a climate scientist is praying doom, or if a political activist is doing this. It even means something different (and people pretty well know to make differences). do you mean we should avoid becoming or seeking to become climate friendly consumers? "instead, we could find out what alternatives are around"
Trivia about NEF's 100 Months campaign. (2) There are currently two different 50-strong half-time pep-talk teams. 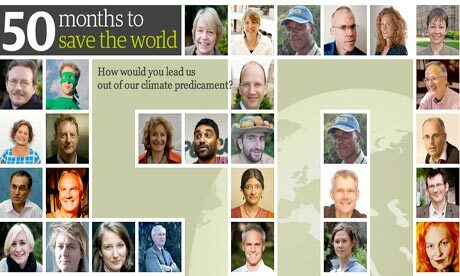 The Guardian's 50-talking-about-50 team doesn't include Joe 'Climate change isn’t special' Smith. NEF's does. (So well done, NEF, and shame on you, Guardian.) Which is the authentic 50? Mark B - could you please tell me, where I could validate your claim concerning James Hansen and the need for doing something until the end of Obama's first term? "We cannot now afford to put off change any longer. We have to get on a new path within this new administration. We have only four years left for Obama to set an example to the rest of the world. America must take the lead." This was immediately translated by the journalist to Barack Obama has only four years to save the world"
and then spread all over the "skeptic" blogosphere as "Hansen predicts end of the world by Dec 2012, haha". Not even the reference to Mayan prophecies missing.
" Hence his warning to Barack Obama, who will be inaugurated as US president on Tuesday. His four-year administration offers the world a last chance to get things right, Hansen said. If it fails, global disaster - melted sea caps, flooded cities, species extinctions and spreading deserts - awaits mankind." "The world was now in "imminent peril", he insisted, and nothing would quench his resolve in spreading the message. It is the debt he owes his grandchildren, after all." Imminent peril. Not a slope of gradually increasing risk. Imminent peril. As far as I know, Hansen did not demand a change to this article to correct anything the author wrote. The skeptics didn't put words in Jim Hansen's mouth, and if the writer did, Hansen certainly had the opportunity and power to make the point. He did not. Given Hansen's obsession with tipping points, I think it's reasonable to interpret 'four years' and 'imminent peril' to mean exactly what they seem to mean. One can, of course attempt to weasel out of the plain English interpretation of Hansen's words. It would have been nice if those who attempt to do so now did it back then, when it would have mattered. It's not like I'm turning a climate dove into a hawk here.